There is no reason for anybody to dread the largest full moon of 2013, known as the "supermoon," a NASA scientist says. On Sunday (June 23), the moon will reach perigee — the closest point to Earth in the rocky satellite's orbit around the planet. Although some people have suggested that the supermoon might drive people crazy, cause natural disasters and wreak havoc on the tides, there is scant evidence in support of those claims, NASA assures. "There should be no impact on anybody on the Earth," Petro said during a series of televised interviews on NASA TV. "There should be nothing unusual except maybe for more people staring up at the moon, which should be a wonderful thing." To skywatchers that have been monitoring the moon recently, Earth's lunar neighbor could look slightly larger and brighter this weekend, but it might be difficult for the average observer to notice a difference in this full moon and the 11 other full moons this year, Petro said. "It's a subtle difference," Petro said. "It really is a reward for people that are looking at the moon quite regularly." Still, Petro said, everybody should step outside to see the supermoon, weather permitting. The moon will reach its peak fullness on Sunday at 7:32 a.m. EDT (1132 GMT). About half an hour before that, the moon will reach perigee, making it appear about 12 percent closer to the Earth than the full moon will be at apogee — the farthest point in the satellite's orbit — on Jan. 16 of next year. At its closest approach on Sunday, the moon will be about 221,824 miles (356,991 kilometers) from Earth. On average, the moon is about 238,900 miles (384,402 kilometers) from the Earth. The best time to catch the lunar wonder is just after sunset on Saturday night, but anytime this weekend will do, Petro said. Simply walk outside and look to the east today, Saturday or Sunday to catch the cosmic show. Editor's note: You can see amazing photos photos of the 2013 supermoon in our gallery: Supermoon Photos: Biggest Full Moon of 2013 in Pictures . 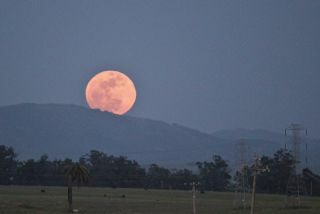 If you snapped an amazing photo of the Sunday Supermoon and you'd like to share it for a possible story or image gallery on SPACE.com, please send images and comments, including equipment used, to managing editor Tariq Malik at spacephotos@space.com.